???????? © 1990 Hudson Soft. Momotar? 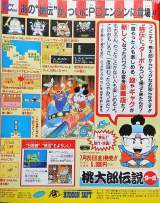 Densetsu Turbo is a traditional role playing game by Hudson Soft, conversion of a Famicom game. The title can be translated as the 'Legend of the Peach Boy' and the game is loosely based on a really old and popular story from Japanese folklore. The story starts when an old childless woman finds a giant peach floating down a river. She brings her treasure back home and as she tries to eat the curious fruit with her husband, a child suddenly jumps out of it and presents himself. He is Momotar? and he is sent by the heaven to be their son. His mission is to defeat an outbreak of demons (Oni in Japanese ) that disguise themselves as humans and walk the world. Later, Momotar? meets a trio of friends (Inu the talking dog, Satu the monkey and Kiji the Pheasant) who promise to help him in his quest. Momotar? Densetsu Turbo, however, is a one-on-one early role playing game - Momotar? fights against foes on his own and his companions only randomly help him in battle. Our friend starts his journey in a small village nearby his parent's house with 100 coins in his pocket, but there will not be much left after buying a nice wooden sword (boken) and a couple of rice balls. He soon begins to explore the five continents and finds his first master - the old hermit challenges him in a single combat and rewards him with his first magic spell. Simple menus gets the player to talk to people, use items and spells, equip weapons or activate Momotar? 's buddies. The backup-system allows the player to save his journey. Released on July 20 1991 in Japan for 5800 Yen. Momotar? Densetsu (literally meaning 'The adventures of Peach Boy') was first released for the Nintendo Famicom in 1987.